After a Kentucky State Trooper attacked a man filming he then allegedly punched another road worker, so he was placed under citizen's arrest. Louisville, KY — A Kentucky State Trooper on a power trip allegedly got violent with a road construction crew over the weekend. However, as the video of incident shows, unlike most scenarios with cops on power trips, it was the Trooper who got taken down, not the citizens. 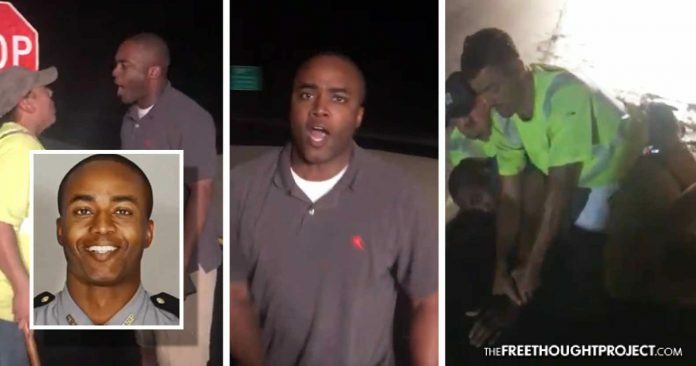 According to video and the witness accounts from the road crew, Trooper Anthony Harrison punched a worker and put them all in danger as he drove through a construction site Sunday night. According to the crew, Harrison drove too fast toward their work zone near Fort Knox about 11:30 p.m. Sunday, adding that he stopped his personal car abruptly, confronted the workers and started arguing. Two of the workers told WDRB that Harrison was angry about not seeing the crew and their equipment in a closed-off and marked traffic lane. In the video, Harrison is seen yelling at one of the workers over their disagreement and gets belligerent with the woman who asks him not to yell at her. “Don’t yell at me,” the woman says. Harrison flashed his badge and let it be known that he was a trooper, however, he still got unnecessarily violent. When Harrison noticed that he was being recorded, he became even more enraged. He then appears to attack the man filming and at this point, all hell breaks loose. At this point, the crew takes Harrison down and disarms him in a citizen’s arrest as they called the police. The crew’s level of force appeared to be entirely justified and kept to a minimum, only using enough force to hold Harrison down. Unlike many police officers would’ve done in this scenario, no head strikes, baton blows, or tasers were used to subdue the officer. “That badge doesn’t give the right to get in someone’s face like that,” the woman said as they held down Harrison. The crew then continued to hold Harrison down, without incident, until police officers arrived. However, once police arrived everything changed — they let him go. Gaddis explained that once the other troopers showed up, they immediately moved to protect their brother in blue by treating the road workers as the criminals. According to WDRB, KSP said they’ve started an internal affairs investigation and that what’s on the video does not reflect the image the department strives for with the public. The most disconcerting aspect of this scenario is that had Harrison been a regular citizen and not a cop the result would’ve played out much differently. If a regular citizen would’ve just gotten out of their car they would’ve been subject to police force and arrest. However, if that regular citizen then became violent with the crew, like Harrison was seen doing, they most assuredly would’ve been arrested. But not if you are a police officer. The videos below make two powerful points. The first point is that police officers are not magically protected from citizens they abuse. This cop appeared to be entirely in the wrong and the citizens acted to stop it and did so with minimal force, providing an excellent example of how police should do it. The second point is that even though there was video evidence of Harrison losing it and assaulting a person for filming, most likely due to the fact that he is a cop, Harrison was not arrested and will likely face no punishment.